When it comes to journalism and business/organizational writing, readers don’t have all day to get to “the point.” They want to know what a piece of writing is about, and they want to gauge quickly whether they should keep on reading. 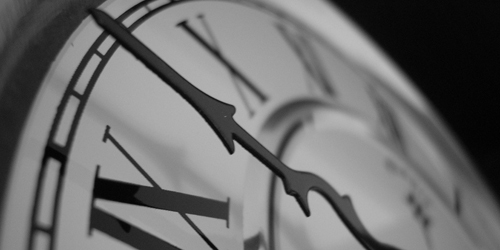 How do you make sure you’re not wasting your reader’s time? In short, don’t just turn on the word faucet. Instead, pause and plan before you write—and think like a reader in a hurry. Here are a few pieces of advice to help you get to the point quickly, inform your reader quickly, and make your writing more meaningful. – Avoid starting your story with “when” or other past-based constructions that smack of “once upon a time.” Following this advice will prevent you from starting a story at the beginning. And you do not want to start telling your story at the beginning. (When I say “story,” I mean “article,” “essay,” “report,” “case study,” “news release,” or, well, “story.”) Why? Because it shows that you haven’t processed and prioritized the full range of your information in any sort of meaningful way. You’ve defaulted to a six-year-old’s way of storytelling, so your story can at times sound like a six-year-old wrote it. You’ve started at the beginning of events because it seems “natural” or because you don’t want to leave anything out. But knowing what to leave out is one of the secrets to being a good writer. Open your writing by telling your reader about the most important development or piece of action that has happened. Sum up the “need to know” bit of news first. You can backtrack and do some storytelling later. In a way, you’re following the lead of the Ancient Greek storytellers. You’re starting almost in medias res—in the middle of things. Tell your reader where things stand now. Tell the reader what things are like now. Give the reader news. From there, you can go “back in time” and explain how the news developed. You can provide additional information that brings more context and meaning to the news you’ve presented. Then you can move “forward in time” and paint for your reader what’s likely to happen next—whether it’s the next step in a legislative process, marketing plans for a new product, potential effects of the events you’re reporting on, or some avenue of action for the reader. Put thoughts of reader quantity out of your mind. You shouldn’t be trying to get a lot of people to read what you’re writing. You should be trying to get a lot of the right people to read what you’re writing. Know who your target audience is—whether it’s all voters within a state or just five experts in an obscure scientific field—and write with those people in mind. – Don’t “oversharpen” the point that you’re trying to get to. Sometimes writers have the tendency to weigh down their lead (i.e., their first sentence or two) with too many details. Those writers are indeed getting to the point, but they’re doing it in a very cluttered fashion. If you’re writing about a vote by a subcommittee, there’s no need to cram into your lead the vote count, the full name of the subcommittee, the full name of the larger parent committee, and the full title of the legislation being voted on. “A House subcommittee on Tuesday approved a bill that would require widget makers to add new safety features to their products” delivers the point cleanly. Remember that readers today can find a near-endless supply of personally relevant content online and in print. The content competition is great. Reader patience and attention spans are not. A clunky lead that’s slow getting to the news portends a clunky, time-wasting story—and a story that an impatient reader might skip entirely, even if it is a story that the reader would find relevant upon further reading. Huh? There’s no need to tell me how to feel. On the other hand, if the widget makers or some real widget users actually react to the subcommittee’s action (i.e., open threats, street celebrations, public lamentations, etc. ), then blending news of that real reaction into your lead could be wise. – Strive for a headline or title that echos your lead and that, likewise, will not waste your reader’s time. Headlines can tease a reader into reading a story. Many headline writers love the art of the cute/mysterious/vague headline—the headline that prompts the reader to think, “Hmm? I don’t quite know what’s going on, but it sounds cool. I better read the article.” Sometimes that approach can backfire. Headlines are just another point of entry for a reader, and sometimes the reader wants the points of entry clearly labeled. If the headline is too vague, the reader will abandon the story before reading it. So writers should advocate for headlines or subheadlines that convey some smidgen of information, some news—not just cute plays on words that make sense only after the reader has finished the article. Headline writing is an art, and there’s room for mystery in headlines. Just be aware that the headline can be a sharp, clever, curiosity-grabbing hook for the reader, an informative, useful point of entry for the reader, or a time-wasting mystery to the reader. – Use graphical elements to help your reader absorb the news or key points quickly. Bullet lists, sidebars, at-a-glance boxes, pull quotes, photos with captions, underlined/bold/highlighted text—these are all simple, common tools that writers sometimes forget to use. These tools can help a reader skim and skip her way to key bits of news that might lie hidden within a larger, gray block of narrative text. In using these tools, you can effectively give your reader shortcuts and additional points of entry to essential information. You save time for your reader. You let your reader quickly determine the relevance of the overall article. You help the reader decide if she wants to read more. Yes, you might have to enlist the help of a graphic designer to make some of these tools appear, but the effort is usually minimal—and usually worth it. Readers ultimately are going to waste time, whether they want to or not. As a writer, your job is to remain unhappy with that proposition. Your job is to help readers get information efficiently. Your job is to use your time wisely. Your job is to pause and plan before you write—and to think like a reader in a hurry.